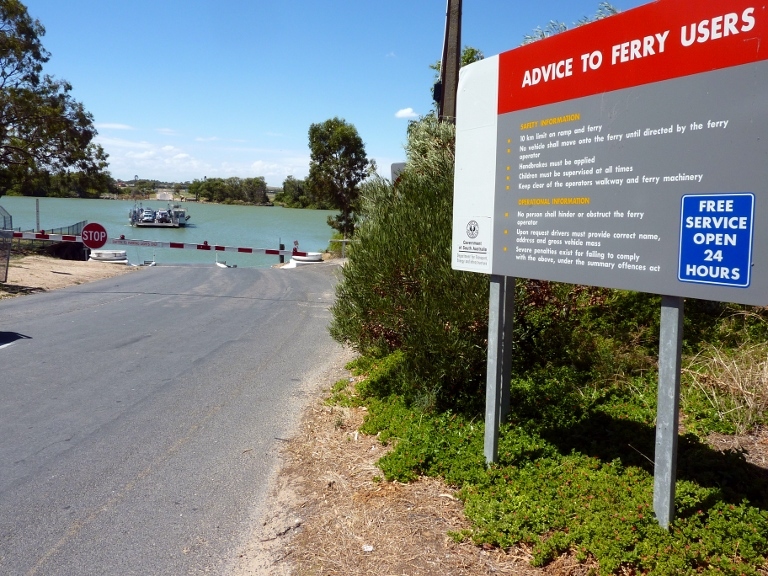 The only way across the river in town is by ferry. Port Campbell is about half way from Melbourne to Kangaroo Island. The Great Ocean Drive changed from twisting hilly roads hugging the coast to a flat straight away through remote salt flats and ponds along a sand dune shoreline. Gas stations at remote intersections had signs “last fuel for x amount of miles”. In four hours we reached a resort town of Robe, where all the tourists had gone home. There we changed our next stay from Adelaide to Normansville because of the distance to the Kangaroo Island ferry was 2 and half hours compared to 20 minutes for Normansville. Luckily we did for our stay was on a golf course condo where at sundown a pack of kangaroos grazed and hopped their way up the course to the condo. Golfers stopped and watched, residents came out and watched and Ann chased after them with her BlackBerry snapping pictures. All was good in Normansville for we made the ferry the next morning and ferried to KI to the port town of Penneshaw. A short distance outside Penneshaw was our B & B “Lindsay”. It had everything we needed with a clean ocean feel design that overlooked the Indian Ocean. It felt like the right place to relax after 12 hours a day of Australian Open tennis spectatoring and Great Ocean Drive touring. We had one rainy day and that is exactly what we did, catching up on the trip maintenance using the complimentary Internet connection. The Island is big. A 2 hour drive will get you across the island and outside the eastern towns of Penneshaw and Kingscote. It is pristine. It has become like a Noak ark for Australian endangered species. Both of the only egg laying mammals reside on the island; the platypus and the echidna. A big bull seal letting us know its his beach. The Australian seal has made a home on one of its bays and the gray kangaroo that is extinct on the mainland is thriving on KI. There are private sanctuaries where many animals are kept and a national preserve where land and animals are under national protection. The highlight of the stay was visiting the Australian Park service at seal bay where the Australian seal has made its home. 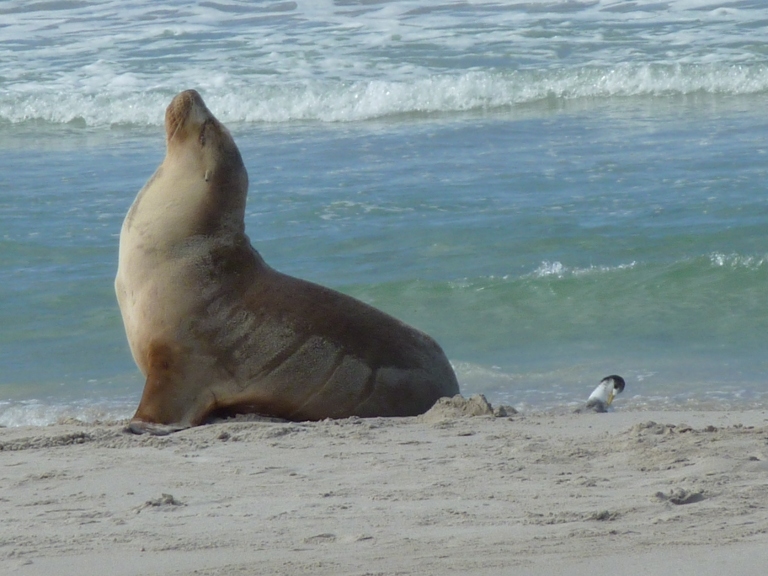 The park service provides a guided tour of the beach the seals bask on. The seals have it made and humans get to enjoy their presence. Its a beautiful beach, ripe for a resort, but the seals are king and it’s a beautiful sight and sound. Its really remarkable that its possible to walk amongst them. Class is in session for the pelican man. Probably the most unique show on the island is what is billed as the pelican man in Kingcote. Down by the local docks a man shows up at 5:00 everyday with a tub of fish. About 50 Australian pelicans start flying in around 4:00 and flock up and wait for the pelican man. Around 4:30 about 50 tourists drive in and flock up on the huge bouldered shoreline and wait with the pelicans. Pelican man shows promptly at 5 with his tub of fish and stands on the lowest shoreline boulder with the pelicans and tourists in his front in a tiered boulder fashion. He gives a 15 minute informative dissertation on the pelican that sends the pelicans quivering and the tourist into snapshooting. 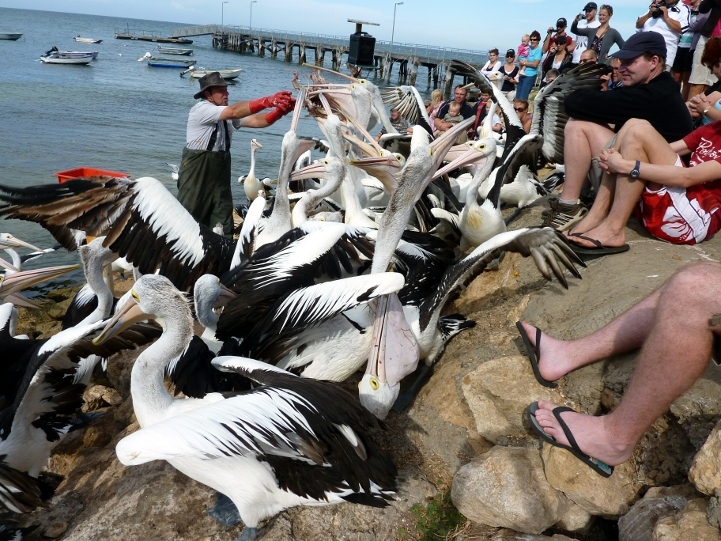 Finally he throws heaps of fish into the audience of pelicans and a fish gobbling frenzy ensues for a seconds. He throws more fish more frenzied gobbling. Its a real scene of pelicans and tourists all together on the boulders. Did I mention the fine beaches of KI all of which are all deserted? We took a week driving across Australia to Sydney and got prepared for moving on to South Africa. Please check out the pictures of wonderful beachtowns of wonderful Australia captioned in the pictures.